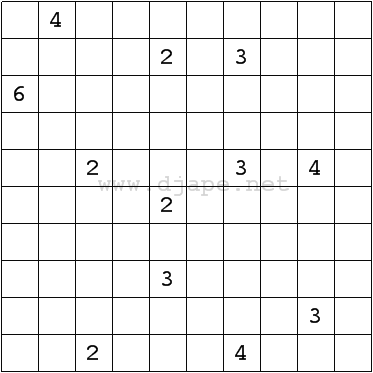 This entry was posted in Free sample puzzles, Killer Sudoku, Puzzle variants, Samurai sudoku and tagged Daily Killer, Daily Killer Sudoku, Daily Sudoku, killer, killer sudoku, rules, samurai, Samurai Sudoku, Weekly Samurai, Weekly Samurai Sudoku. Bookmark the permalink. Post a comment or leave a trackback: Trackback URL. Not very difficult, but was confused about the rules. Can the white areas touch by the corners? The white areas can touch diagonally. Another important point is each white area contains one and only one number. You cannot create a white area out of blank cells, and you cannot join 2 numbers into a single white area. Yeah, that’s what I thought, but in that case the puzzle doesn’t have a unique solution. They all have unique solutions to me. If you believe a puzzle have multiple solutions, just post at least 2 of them out, and see if others can point out if you have made a mistake. It is just a coincidence that all the white areas in the solution do not touch diagonally. If you found other solutions with diagonally touching white areas, they are certain to violate the rules, one way or the other. This puzzle isn’t that hard. The problem mainly is that it is too minimal. It works only on the fact that the islands will only fit one way so that there aren’t any 2×2 areas anywhere. What makes Nurikabes harder is when there is only one way that all the water can connect AND there are no 2×2 areas anywhere. At least that is my opinion. Compare it for example to this 9×9 nurikabe I made. Thank you for the 9×9 nurikabe. I think it makes a very hard puzzle for most players. Especially those who are not familiar with Nikoli puzzles. 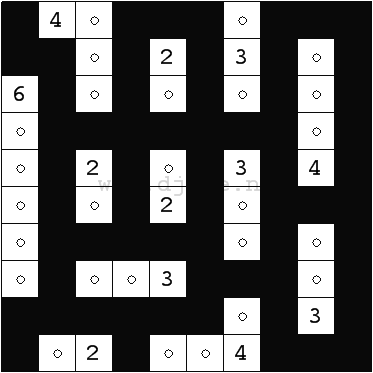 From this position, to ‘grow’ the white area for the 5-clue, it must include A,B,C or D.
It cannot include A or B because that would ‘link’ the 5-clue and 6-clue diagonally, and that in turn would prevent the black cells from being connected together in one piece. It cannot include C because it would very quickly force the 4 cells in rows 2 & 3, columns 8 & 9 to be unreachable from all number clues, thus creating a 2×2 black area. So the 5-clue must ‘link’ to D and also the 2 determined white cells above, and the whole white area for the 5-clue is determined, and the puzzle becomes very easy from that step. I wonder does anyone have a better way to solve it? I don’t know why, but in my grid some groups of short dashes are automatically changed to long dashes.